The staggered birth of Kaveri has been an interesting story to cover but it has been difficult to keep all the pieces right in the forefront of memory. The initial launch in January 2014 saw a small number of SKUs such as the A10-7850K and the A8-7600 at first and since then we have had a small trickle at a rate of one or two new models a quarter hitting the shelves. We've seen 65W SKUs, such as in the form of the A10-7800, which offer 45W modes as well. Today we're reviewing the most recent Kaveri processor to hit the market, the A8-7650K rated at 95W and officially priced at $105/$95. I first created this table with launch pricing, and it had some of the APUs/CPUs moved around. 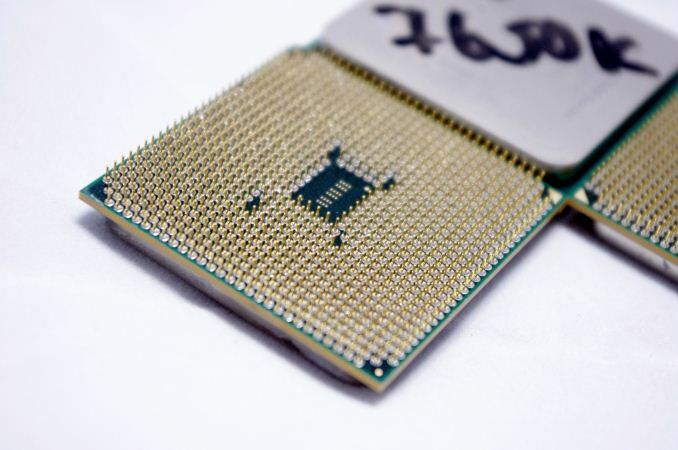 But since the release dates of these processors varies on both sides, the prices of individual SKUs has been adjusted to compete. Perhaps appropriately, we get a number of direct matchups including the A10-7700K and the Core i3-4130 at $120 right now. This table is by no means complete, due to Intel’s 20+ other SKUs that fight around same price points but vary slightly in frequency, but that tells a lot about each sides attack on the market. Some of AMD's recently announced price cuts are here, but for consistency our results tables will list the launch pricing as we have no mechanism for dynamic pricing. Testing AMDs APUs over the years has provided results that these are not necessarily targeted to the high end when it comes to multi-GPU systems that total $2000+, although AMD wouldn't mind if you built a high end system with one. The key element to the APU has always been the integrated graphics, and the ability to offer more performance or percentage of transistors to graphics than the competition does at various price points (irrespective of TDP). Ultimately AMD likes to promote that for a similarly priced Intel+NVIDIA solution, a user can enable dual graphics with an APU+R7 discrete card for better performance. That being said, the high-end APUs have also historically been considered when it comes to single discrete GPU gaming when the most expensive thing in the system is the GPU as we showed in our last gaming CPU roundup, although we need to test for a new one of those soon. Part of the new set of tests for this review is to highlight the usefulness of dual graphics, as well as comparing both AMD and NVIDIA graphics for low, mild-mannered and high end gaming arrangements. The new APU fits in the stack between the 65W A8-7600 and before we get into the A10 models with the A10-7700K. It offers a slightly reduced clock speed than the A10, but it is built (in part) for overclocking with the K moniker. The integrated graphics under the hood provide 384 SPs at 720 MHz, being part of AMDs 4+6 compute core strategy. 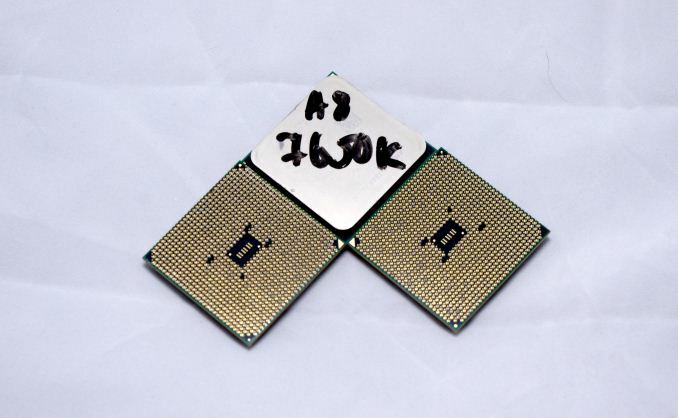 The A8-7650K is designed to fill out the processor stack to that end. At a list price of $105 (current $104), we were at a quandary with what to test against it from team blue. The Pentium G3258 sits at $72 with two cores at 3.2 GHz and HD (Haswell) GT1 graphics. The next one up the stack is the i3-4130, a dual core with hyperthreading and HD4400, but sits at $120. Ultimately there is no direct price competitor, but AMD assured us they were confident in the positing of the SKUs, particularly when gaming is concerned. Due to what I have in my testing lab, the nearest competitor to this is the i3-4330, a model with a larger L3 cache which has a list price of $138, or the i3-4130T which is a low power SKU. The PS4 processor, which AMD makes, is an R9-280 with an 8 core CPU. The problem is that it would be memory limited quite badly on a PC motherboard. In the PS4 it's paired with very fast memory. Its not a 280 -- Its got 20 GPU clusters only for 1280 shader lanes, two clusters are there for yield purposes and 4 more are dedicated to compute tasks. It has only 896 shaders dedicated to graphics, and and 256 for compute (though some engines leverage compute during rendering, so the line is a bit fuzzy). The PS4 has a 512bit memory bus, which is really wide for the GPU power, but its also feeding CPU compute. Its got 8 ACES like the 290/X. The 280 fully unlocked has 32 clusters for 2048 shaders. A 280/X has a 256bit GDDR5 bus, and only 2 ACES.